The school I visited on Friday in Boston is the smallest I will see on this trip, just 43 students in grades 6-12 on the third floor of a brick building on Beacon Street. Many will be tempted to dismiss the lessons from such a school as not applicable to their own issues and opportunities. It is tempting to say, “They are so small, they can do whatever they want; they don’t have the same obstacles we do.” But that would be wrong. The takeaways are not about how a school works; it is about what they are doing. Some of what they are doing is very scalable and translatable to all of us, like the lessons of the lab schools back in the dawn of the Progressive Era. Meridian Academy was founded by Josh Abrams, and it is about as progressive as you are going to find. Describing the entire program would take a day; go instead to their website and see what true interdisciplinary learning can look like. It may look like what you would design if you had a totally blank canvas, which is what Josh wanted after a career of teaching in traditional public and private schools. In summary, they combine all of math, science, and engineering into a sequence of multi-year, thematic courses, and do the same with the humanities. Language and art get some of their own designations, but they are both woven into the other courses as well. I sat in all of their classes, talked to all of their teachers, and to a number of the students. It was the most natural learning environment I have ever been in. What do I mean by “natural”? It was the closest I have seen a school come to mimicking what and how the rest of the world actually works. It is utterly seamless and completely contextual. I will quote students at the end of the blog and we will hear the words they use to describe the fluidity and sense that flows through their day. First, some nuts and bolts of how a school can provide a rich, deep curriculum in downtown Boston with just 43 students. It is not due to high tuition; they charge $22,000 a year and put 40% of that back into financial aid, so their net budget is about $13,000 per student per year. The teachers make less than public school salary, but not by a lot. Josh does not take home as much as he would if he were teaching in another school. A huge leverage they take advantage of: the city of Boston. Meridian has a rich curriculum because they leverage the HECK out of free resources in the city: they go to museums, the Copley Library, music events, an educational lab at Biogen, MIT, and others. All are free. They don’t just go for a field trip for an hour or two; they go for a day, and the folks at these places love to see students who want to come to really learn, not just visit. The librarian at the Copley is tickled to spend 3-4 hours with the students as they conduct research. Josh is getting a ton of free instruction for his students just for showing up and asking. They don’t admit students based on academics; they admit students who will succeed in this environment. Even though they struggle with finances, they don’t admit students who will flounder. Next year they will have about 55 students and the goal is to top out at about 80. Most importantly, they admit students with a mixture of strengths and weaknesses as that makes the learning richer for all the rest of the school. They have graduated two small classes of seniors, and Josh shared with me the average SAT and ACT scores which are very respectable but don’t mean much in such small numbers. They have no grades. Their transcript submitted to colleges consists of a one-page summary of research and projects written by the student and a one-page student profile written by the teachers. Josh says that college admissions officers are very happy with what they provide as they have a ready-made story to tell, and one that stands out from all of the high GPA’s and AP scores on all the other transcripts. The colleges recognize that these students have learned to research, design, experiment, think, learn, analyze, and, most importantly, “how to get unstuck if they are stuck. Our students are really good at problem solving, but more importantly at problem posing. That is what we do here.” What colleges is not going to love it? Meridian has completely blown the doors off of subject silos. The courses are uber-interdisciplinary. The students learn content when they need it for a problem they are working on, not at some time determined by their biological clock. 21C skills are not embedded in their classes; 21C skills are their classes. They iterate the heck out of their work. All of their assessment is based on preparing projects and presenting them to an internal and external audience sevral times a year, and since they are presenting their own work, they want it to be good. 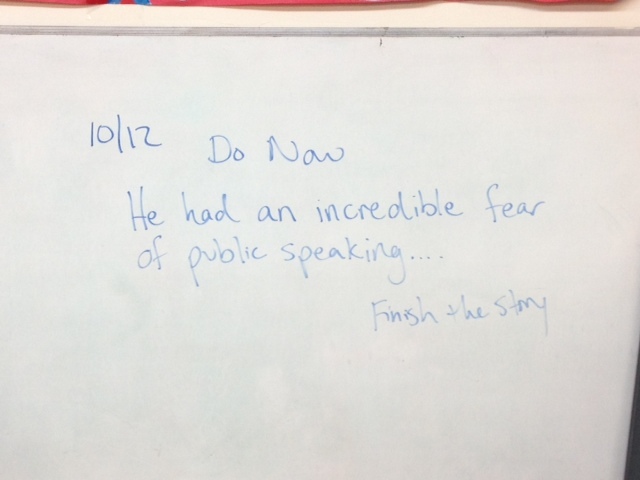 Both the teachers and students told me that it is nothing for a student to want to rewrite a paper or poem 8-10 times before being satisfied they have done their best. You can see the nature of the courses on their website. Despite the interdisciplinary names, or rather because of them, by the time the students graduate they have been through a year of biology, chemistry, physics, statistics, math up to calculus, seven years of art and Spanish, and a ton of humanities. Sometimes teachers lecture at the front of the class if that is what is needed; other times they set up a range of tasks and the students take over. They don’t think there is one way to teach, but they certainly view teachers as mentors rather than providers. In the 6-7 grade math class the students told me how triangles relate to the shape of tree leaves; how ratios could be applied to the size of a tree and the reach of its branches. They told me how they learned estimating by working out the number of hot dogs consumed at Fenway in a year and the number of likely piano tuners in Boston. In the high school algebra-biology-stats class they learn to set up their own problems, define questions, and “simplify, represent, and interpret”. Some of the recent problems that students have thought up, researched, solved, and presented for assessment: how to eat a Reese’s PB cup with the same portions of chocolate and peanut butter in each bite; how to harvest lobsters without a population crash; how to reduce tension at a meeting of the U.N.; how to design and build a pendulum clock. At the end of the visit, I asked Josh what he thinks is truly transferable or scalable from their model to other schools. The fluidity of learning created by truly interdisciplinary courses. Many schools have cross-departmental classes but most still try to get through the traditional quantum of material by the end of the year. The Meridian approach is to create opportunities for student engagement and use “just in time” content provision. The lack of grades and assessment by portfolio and presentation is something that other schools do. It clearly focuses on, and aligns with, formative learning goals. The teacher-student mindset of co-learning and adapting to current interests. They don’t necessarily change their course material every year, but they will when they want to and, more importantly, if the students self-direct into new tangents of interest. Using community resources. They are lucky to be located close to so many great resources, but many others are as well. But you need to get rid of the time silos in order to leverage those. I said that Meridian is a natural learning setting. It is straight out of Dewey, Parker, Parkhurst, and Montessori. If I haven’t shown my bias strongly enough, I will say that it is a learning pond, a system that operates along the lines of a natural, not manufactured system. Meridian is doing today what the founders of modern education were preaching in the past, and what so many of us are talking about as the future. Reblogged this on Faith Amuses. Thanks for noting my post in your blog! I am very pleased that my granddaughter Julia is a student there. Thanks; I have been telling people about the great work at Meridian all along my trip. A great learning place. It seems like an amazing school. I’ve been searching for a school for my children with an “outside of the box” approach to education. I’m really impressed with The Meridian! Thank you for your story. A remarkable group of educators and students; check them out! 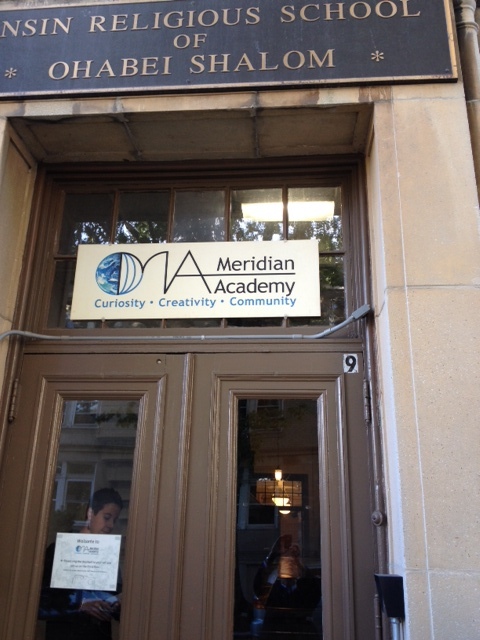 Meridian Academy – Absolutely incredible! I had the honor, privilege, and fun because I was one of Josh Abrams’ friends from 7th – 12th grade at our small pretty progressive school in NYC. Class of 1979. Fast forward to 2013: With the pressure and expectations seen at most public and private schools including the goal and better strive for that prize: 4.0 grade point average – or else, typical standardized TEST expectations: PSATs, SATs, ACTs, SAT II Subject Tests, and countless more, college websites’ so called academic and extracurricular profile of students they might deign to admit, and with great pressure placed on students to get that A in the most difficult courses offered at schools by parents, I breathed a sigh of joy and relief reading about all that The Meridian community of teachers, students, and parents is, and is not. Thank you! I’m breathing again, feel sane, and hopeful. I am the lucky mom of a wonderful sophomore in H.S. daughter. I think I can give more to her and what she deserves because I was invited to look into the wide open window of The Meridian Academy tonight.